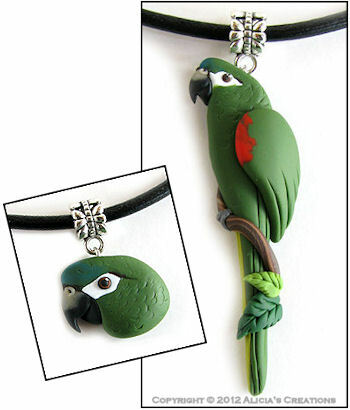 BIRD OF THE MONTH: Vasa Parrot + Pendants! 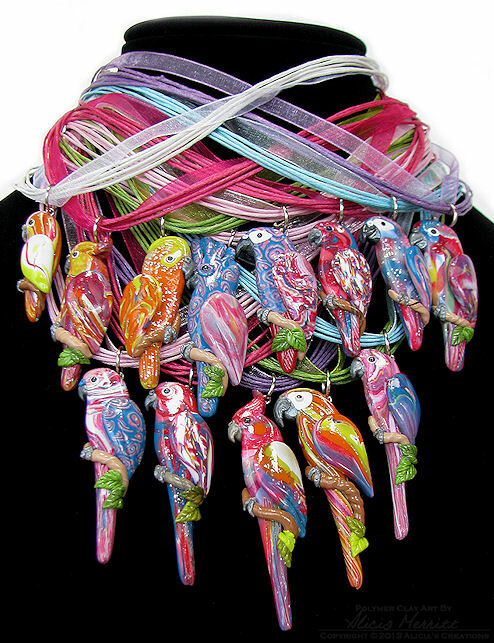 I recently had a request on Facebook to create a Vasa parrot, and it's not a bird species that I've ever had an order for before, so I was fascinated to read about how unique they are among parrots. Not only does the female actually change her feather colors during breeding season, but she molts her head feathers out, and the skin on her head turns yellow! So while I had another bird in mind for this month's Bird of the Month, I ended up creating the Vasa instead, after being inspired by all of the photos that I found while reading about them! It's always fun to sculpt a species that I've never created before! 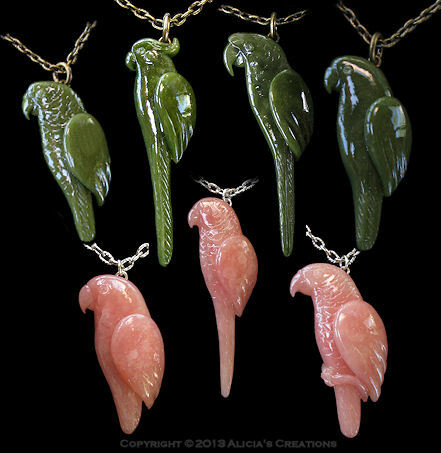 In addition, there are several round pendants on sale this week, including two mini-pendants (conure & macaw) starting at just $9.00! 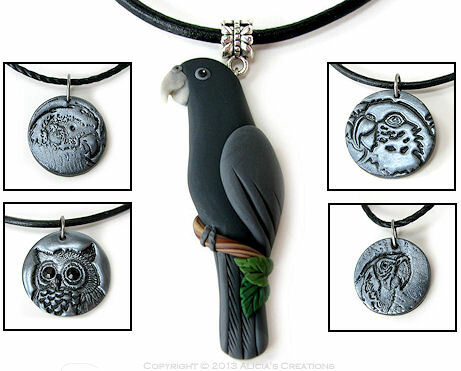 I created another owl pendant with Swarovski eyes, and a new design that has a Caique type of parrot face. All of the jewelry is being auctioned on eBay for five days, ending on Tuesday, July 30. I know there are a lot of you who are anxious to be able to place custom orders again, and I want to thank you for your patience and understanding with the health issues that I'm still experiencing. I had planned to resume accepting a limited number of orders this month, but ended up not feeling well enough. So, we'll see how things are in August, and hopefully I'll be able to get back to custom work then! 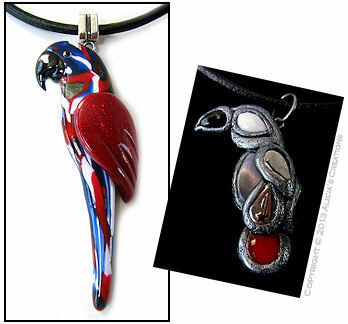 I've made another "scrap clay" pendant, this time in red, white, and blue! This bird resembles a macaw, and has a glossy finish. 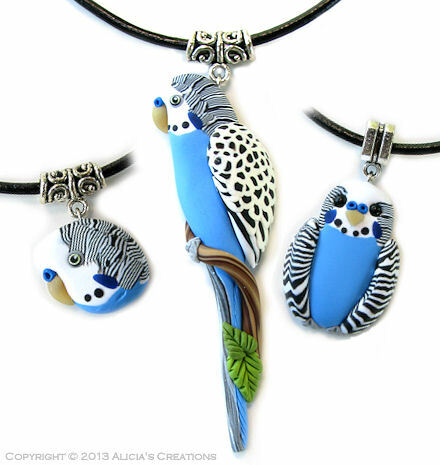 I gave myself a little challenge to come up with a new way to use some broken and scratched beads, and the bird on the right is the result!. I turned each bead around so the "good side" was facing up, and then surrounded each glass bead with clay, with a silver metallic finish. I was going for a Congo African Grey, can you tell? I also have an assortment of about a dozen new magnets from my Joy Magnet Affirmative Art line, and while I don't normally auction these on eBay, I decided to give it a try this month! I am starting bids off lower than what they will be listed for in my Etsy shop, so if you want to snag a great deal, be sure to take a look! All pieces shown here (PLUS more that I just didn't have space to show) are running for 5 days, and end on June 27th - unless they end early with Buy It Now!